You can vote today for a stupid expression animatic from the first draft of the comic. I also started a FB page for the comic, if you want to get your updates there! I’ll get this link added to the sidebar in a bit as well. Next page: lets talk about some goddamn Mars for once shall we???? On your tumblr there was a sketch of Mike embracing a long-haired… person. Was this early in development? Is Mike pan or bi? Was this long-haired person not identifying as a female? Is he messing with Bex? Is this going to be revealed later and I should just stop asking questions (I know the answer to this one is YES)? Again, sorry, I know this is kind of a weird… possibly offensive question? I don’t mean to be ignorant, it’s just… as an aspiring comic artist myself, I’m just so interested in the development of stories, comics and stuff, and how characters come together. And Mike being a not-straight main character is p cool, y’know? I think so, anywho. On another note, all these latest pages are so pretty – I love the contrasting cools and warms, and the way you did the reflections in Bex’s eyes in the first panel is just so gorgeous to me for some reason. It’s subtle, but it’s just perfect. Glad you’re enjoying it so far tho! Alright, that’s totally fair! Thanks for taking the time to reply, haha. Whatever the case, I’m excited to see where the story goes! :) Your art and comics are like candy for my eyes. I am in love with the lighting on the first panel. On the other hand, it was a roundabout compliment that he seemed too desirable a specimen to be single, which he could have acknowledged subtly himself while explaining himself. Instead, he just blurts that out. If he had a lover waiting for him back on earth, he probably would have mentioned him in that polite way; the fact that he didn’t suggests that he has no one, which could contribute to his depression: his work was his life, and he has nothing else. Further, if he was in a relationship with this mysterious Levi, the loss of a loved one without answers would be so much worse then just a friend and colleague. Levi’s an automated drone-bot ._. I got the impression that it was both, a man and a machine named for him. The expression and the lighting on the first panel makes me wonder whether she’s surprised and slightly offended at the blunt question, or whether it’s some kind of foreshadowing to something that’ll be expanded on. Hmmmm. My interpretation is that she’s had doubts about whether she’s a good mother – literally moving to another planet and all. Mike is not very sensitive to other people, his question hit where it hurts. I’m guessing he’s robosexual. totes. Hah, I expected those questions. And they are also along the lines of what I would say in both places, though I usually try not to ask about any family members until the other person acknowledges them first somehow (comes with being a child of a single parent, all those awkward school conversations haha). And I’m guessing Bex’s expression in the first panel comes from being a mother working away from home, or at least her reading that into the question. Bex’s expression in the first panel is an appropriate reaction to what is, between barely acquainted colleagues, an extremely inappropriate question. There’s something accusatory about “are you a good mother,” or at least weirdly existential. It’s something your conscience should be asking you, not your coworker. Though it is nice that Bex doesn’t walk away without some egg on her face. She at least seems more self-aware that she asked something presumptuous. Haha, yeah, it is kind of a rude thing to ask someone! Btw, I like that dash of guilt you painted on the first panel. The last «Oh.» of the third panel — shouldn’t it be Bex’s? …The speech bubble tail comes to the “Uh, none” bubble first. If it had come to the “Oh.” and then led to the “Uh, none” — there wouldn’t be an issue. Yeah, matter of opinion. Layout-wise the eye has a fairly rigid track to follow through the page and main points of interest (faces). I don’t find it terribly difficult to parse but I’ll take another look in the future. By the way, I forgot, I also think “Oh” and “Sorry” on the last panel should be joined by the “intertail” (or whatever people call it) – the conjunction thing. Bubble conjunction. Because it kinda reads as Mike’s reply at first. I guess, commenting so late in the middle of the comment tree might get this one hard to notice, for this I am sorry. Duke, in reply to your comment above (since the comments won’t nest that far)… the “sorry” is implied to not be her speech since it’s being overshadowed by his, which is connected to him directly by the tail. Since he’s not interrupting himself, and to emphasize that he’s talking over her (plus the tail looks visually confusing coming out from under another bubble), the tail isn’t super necessary. Separating them without the connector gives a bigger break/ pause to the reader than connecting with a tail. When I read comics anyways, I perceive the difference as being the difference between staccato text and smoothly finishing a started thought. … and the conversation falls into a lull. The Maps? Oh yes please! I have to say as a mother who loves her kid, but also love’s her work, the expression you have on her face is a perfect reaction to that question. It’s a mix of both, “did he just ask that?” and the question itself rattling around in her head, in her own voice. I don’t know, it’s a question that I am struck by often in my own thoughts when I am away. But yeah, the expression is so perfect. I also like how she kind of gets a playful revenge by prodding him back with similar prodding about domesticity. I tensed up at his question because it’s so often accusatory but then he’s just all “well of course you are” and I love that. Her reaction & expressions are so perfect and human. Oh he’s an homosexual, interesting, slowly, very slowly, we’re getting to know these characters. May not be gay. May be asexual, may even be bisexual. Either way there were no kids. Thanks for picking up on that :) I wanted it to be part of his character, but didn’t want to hide it or make it a plot point or a secret. It doesn’t matter much to the plot, but is worth it to say. Well, thank you for that. I always get bothered when books do that. I mean, secrets are almost always construed as something that the character is ashamed of. Most of the time, those ‘shameful’ things put a really bad taste in my mouth. You skipped that, so thank you, thank you! Why the heck didn’t I see this before, oh my God, it makes so much sense. What happened to the Meek Wiki. I enjoyed reading about the Pasori. That site is in disrepair, I have to wait for some third-party things to finish up before I can work on Meek things again. Is the “Uh, none.” supposed to be before or after the “Oh.”? I’m guessing after, but the arrangement is a bit confusing. Yeah, someone else brought that up… I had to take a step back from this page because I couldn’t see the issue before, but I think I do now. I’ll fix it. Thanks! Yeah, I think I read it the right way the first time, it was only on a different read through that it tripped me up. So I think that guiding the reader’s eye in that way works, but you need to emphasize that flow a bit more, perhaps by working with the angle of the connection between the bubbles, the curvature of the connection between the bubbles, the spacing of the bubbles. Yeah, I know how layout and composition works… sorry if I sound defensive, but I don’t need that stuff explained; I just enjoy trying new things every so often on my own work, and I am happy to fix it if my experiments aren’t successful. Thanks! No it’s okay! I get the value of talking out loud :) I just don’t want each page to become a critfest (not that I don’t appreciate them, but there is a point where it stops being helpful). But do let me know if you want to talk privately or anything, if you like breaking down stuff or have any questions/ comments about panel composition or design I’d be happy to talk via email or whatever! Just wanted to say, it’s okay for an adult to go without children. It’s not an obligation. Many cultures put enormous pressure on their people to do it, especially on women. Modern world makes it a possible choice, history made it a fatality for most so it was just part of life if you were sexually active. Now it’s marketed as a life goal and is deeply imbedded in mentalities. (Plus instincts for most people). So basically, it’s a personnal choice and it’s ok. I know I may be stating the obvious, but I love how in the first panel her head is sort of boxed in by the contrasting warm light from the window and cold light of the monitor. That along with her expression in reaction to the question just has so many complex layers of emotion to peel back that I can’t help but comment (if only to confirm and/or share my interpretations). Second I feel that the box effect that the battling light sources has on her head may be illustrative of how living on mars (in the way they do) would make one feel. There is no physical escape as the only thing around them is the uninhabitable wasteland that is the martian surface. Additionally there is no real mental escape as the only consolation they can find (outside of interacting with other team members which as we have seen can become very strenuous over time) is through the harsh glare of a computer screen that only offers brief and intangible reminders of what they left behind back home. Third, more specifically relating to the question at hand, the contrast of light and her expression indicate a deep internal struggle. She obviously did everything she could to make her children happy and raise them well, but then again she left them to pursue her personal goals, so she is probably very conflicted as to what SHE thinks the answer to his question may be. This interpretation uses the lighting contrast in a less literal way than the last two as it does not relate to actual sources of the light (ie mars and pictures on a screen) but rather solely to the mood the lighting creates. I have only just started reading this comic and I can already tell its going to be amazing. 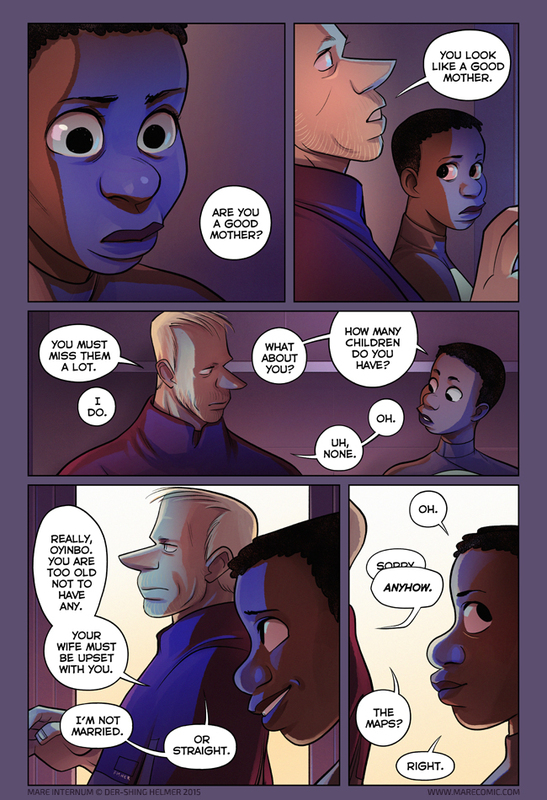 The art has a slightly caricature feel to it (specifically in things like facial features) which gives each character a unique set of expressions and mannerisms while still maintaining a level of seriousness that allows for a level of emotional depth and density as seen in the first panel. It is absolutely breathtaking. Additionally the dialog I find feels so natural and genuinely human that it is quietly yet flawlessly building the characters’ personalities and interpersonal relationships with each and every sentence. I can’t wait to see where this story goes and I have barely even scratched the surface yet. I love the way he says “anyhow.” its exactly the way I say it when I have to get the “I’m not straight, your barking up the wrong tree” bit out of the way with people. Oh Mike, I feel ya man, I feel ya.